Yoga can help prevent and alleviate a number of conditions, from back pain and digestive issues to bone loss, anxiety, and more. 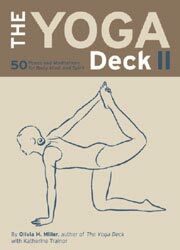 From the author of the bestselling The Yoga Deck, this new deck features 60 poses and meditations designed to enhance well-being. Cards are organized into six sections: Energy; Neck, Shoulders & Back; Digestion; Hips & Legs; Bones & Balance; Anxiety & Stress. Each illustrated card includes step-by-step instructions, a list of benefits, and an affirmation. 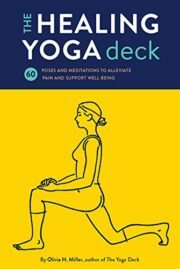 Complete with recommended sequences, this portable deck allows yoga enthusiasts of all ages and skill levels to create personalized routines to target their needs, helping them to feel happier, healthier, and stronger. The deck is available at Amazon, Barnes and Noble, Target, IndieBound, Walmart, and Chronicle Books. 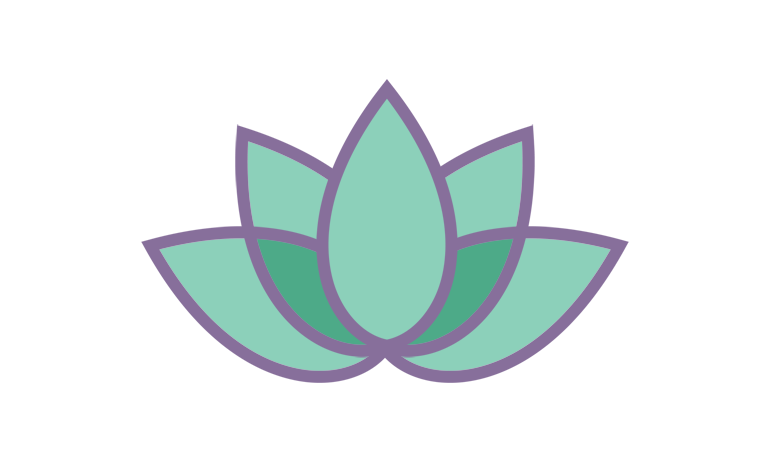 The Yoga Deck allows anyone – from beginners to experts and teachers – to make rejuvenating postures, breathing exercises, and meditations part of daily life. The Yoga Deck is portable and can be used anywhere, anytime. It’s the perfect way to release stress, increase strength, improve flexibility and boost your energy, assisting you along a path of physical well-being, emotional balance, and spiritual growth. Available online at Amazon, at Chronicle Books and at bookstores; it is also available at iTunes for your tablet or smartphone. 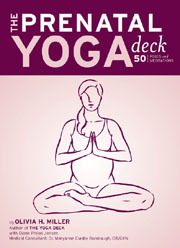 The Yoga Deck II, like The Yoga Deck, allows anyone from beginners to experts to make yoga a part of daily life. It includes additional breathing exercises, poses, and meditations, offering more variety for your yoga practice. 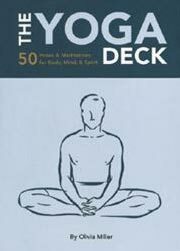 The deck may be used on its own or in combination with The Yoga Deck as a way to attain equilibrium of body/mind/spirit. The deck is available on Amazon. Yoga is an ideal way for mothers-to-be to prepare for birth and labor, stay healthy, and cope with the changes and demands on a woman’s body that occur during pregnancy. 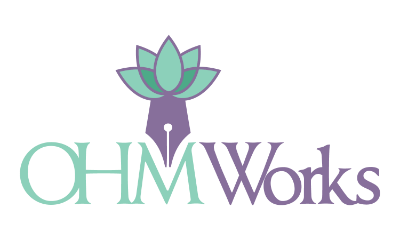 The Prenatal Yoga Deck makes it easy by featuring specially selected warm-ups, poses, breathing exercises and meditations, which are coded by trimester. This physician-approved, portable deck is perfect for use at home, at work, or even on the delivery table. The deck is available on Amazon. Stretching is one of the most effective ways to enhance overall fitness. Whatever age you are or shape you are in, stretching improves mobility, balance and flexibility. 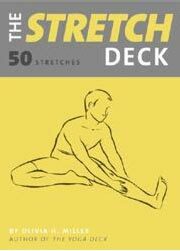 The Stretch Deck is an easy-to-use way to help you feel more relaxed, your muscles will be suppler, stiffness and pain will be reduced, and you’ll enjoy increased range of motion. Grab a few cards and put them by your computer, in your gym bag, on the kitchen counter…and S T R E T C H! The deck is available on Amazon. Eastern cultures have long attributed health and well-being to balanced chakras (energy centers). The Chakra Deck introduces the 7 major chakras: Root (safety), Sacral (relationships & creativity), Solar Plexus (personality/willpower), Heart (love/compassion), Throat (expression/communication), Third Eye (intuition), and Crown (knowledge). 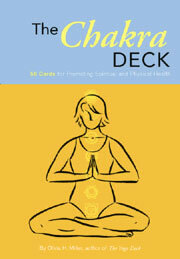 The deck includes related yoga poses, breathing exercises and meditations, designed to balance each chakra. 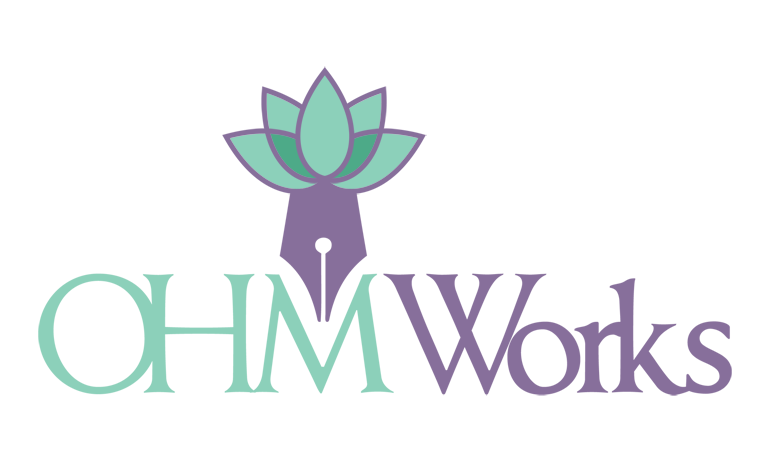 The Chakra Deck can help promote health, vitality and harmony as you begin a journey of profound healing and transformation. The deck is available on Amazon. Nearly as prevalent as the common cold, back-related pain is the second most frequent reason people visit a doctor. A major culprit is “lifestyle issues” – sitting too much, improper posture, insufficient rest, lack of exercise, muscular tension and strain, ergonomics and our old pal, stress. 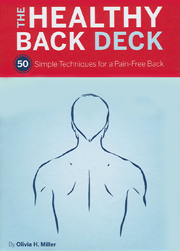 That’s where The Healthy Back Deck can help, featuring stretches and routines designed to restore, repair and maintain a strong, fit and pain-free back. 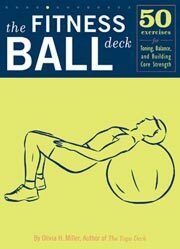 The Healthy Back Deck is a handy resource for bringing a lasting end to an aching back…or preventing one before it occurs! The deck is available on Amazon. 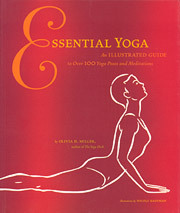 Essential Yoga is a comprehensive reference book for the practice of hatha yoga. It features clear and detailed instructions and beautiful illustrations to over 100 yoga poses, breathing exercises, and meditations. It also includes flowing yoga routines and sessions ranging from 20 to 90 minutes, and 48 sequences for specific conditions (back pain relief, balance and concentration, energy boost) or supporting common activities (biking, running, golfing). This simple and complete guide is geared toward practitioners at all levels of practice. Tips for proper alignment and techniques are included as well as the benefits of the poses, breathing exercises, and meditations. The book is available on Amazon.